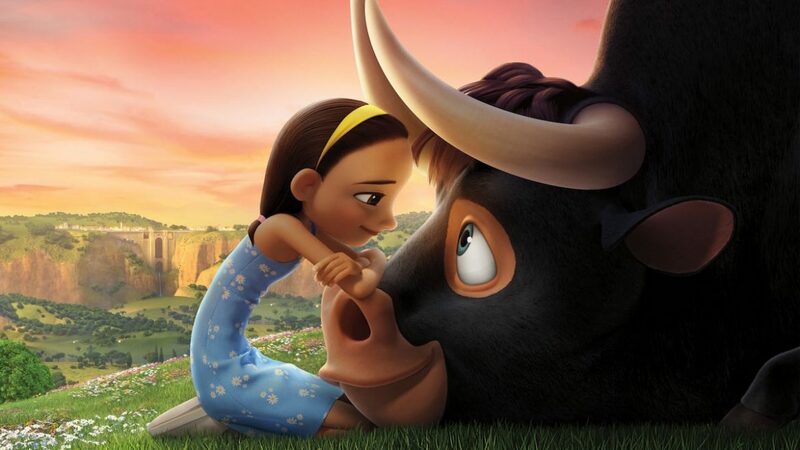 After Ferdinand, a bull with a big heart, is mistaken for a dangerous beast, he's captured and torn from his home. Determined to return to his family, he rallies a misfit team on the ultimate adventure. Animated family films are ten a penny, but there’s a knack to making a good one. 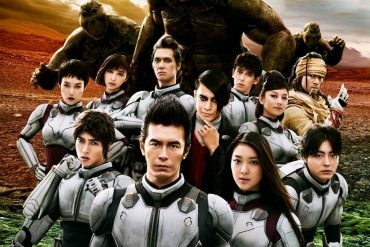 It’s easy to churn out straight-to-DVD movies with bright colours that’ll keep kids entertained for a while, but creating something that appeals to both adults and children is a tough job. Disney and Pixar have led the pack for a long time, but other studios like Dreamworks and Fox have been doing their best to bring the fight to Uncle Walt’s empire. 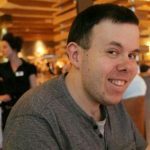 Whether it’s Shrek (2001) or Ice Age (2002), there’ve been a number of viable non-Disney franchises over the years, and competition remains healthy in the animation industry. Fox acquired Blue Sky Studios in 1997 and since then they’ve created many successful and high-quality animations. Beyond the aforementioned Ice Age saga there’s been Rio (2011), Epic (2013), and The Peanuts Movie (2015), to name but a few. 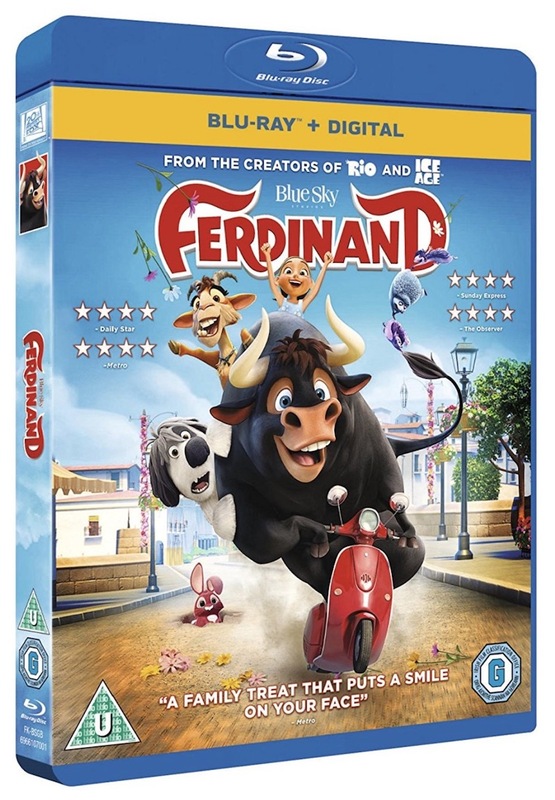 Their latest hit, Ferdinand, is now available on home video for kids to watch repeatedly and drive their parents insane. Trust me, I should know with a nearly three-year-old daughter asking to watch “the cow” a lot and telling me all about his adventures when I get home from work. But how Ferdinand compare to the competition? With an entertaining mix of comedy, drama, and heart, this John Cena-led story delivers another hit from one of the most consistent animation studios in the world. While it doesn’t break the mould, there’s something for everyone. 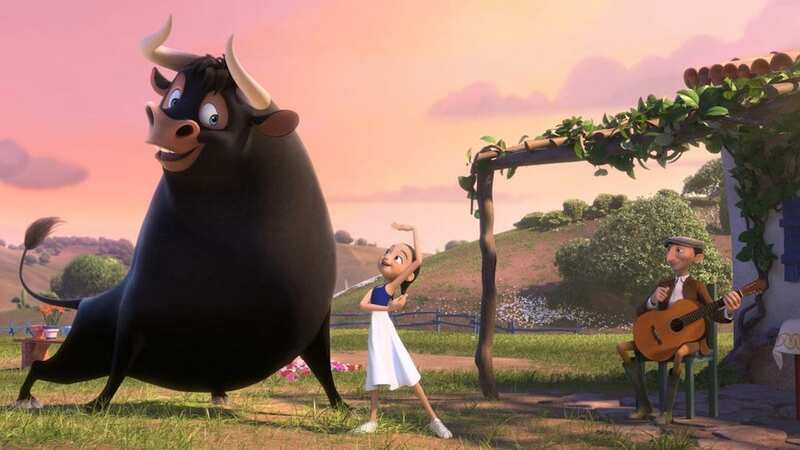 Based on children’s book The Story of Ferdinand, by Munro Leaf, the movie follows a hesitant and peaceful bull who’s the opposite of all the violence that surrounds him. WWE superstar Cena takes the titular role and brings a gentle humour and likability to Ferdinand that makes him easy to engage with. 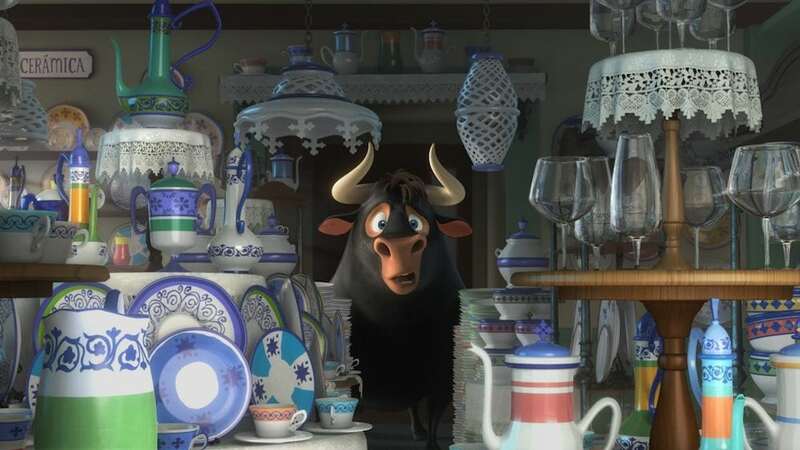 Ferdinand wants to escape the world of bullfighting after witnessing what it does to his dad Raf (Jeremy Sisto), who doesn’t come home after being chosen to fight by the matador. Ferdinand feels alone in the world, more interested in flowers and dancing than the barbaric lifestyle he was born into. This is a story of anti-bullying, learning to be comfortable in your own skin and fighting for something you believe in. Ferdinand has the invaluable heart and warmth that makes good family films so successful. When Ferdinand’s taken in by a local florist’s farm he finally experiences a loving and peaceful environment driven by the young daughter Nina (Julia Saldanha). Unfortunately, due to a mishap at a local festival involving a bee sting, Ferdinand manages to run riot and the family feel he’s no longer safe to keep around. Taken back to his original home he’s reunited with the other bulls who still find his personality laughable, but thankfully Lupe (Kate McKinnon) befriends Ferdinand and takes him under her wing. The only problem is she’s a slightly crazy goat but Ferdinand’s in no position to be picky. Being back at Casa del Toro means he has one choice: fight or die. Those who aren’t chosen by the bullfighter are surplus to requirements and the slaughterhouse calls. 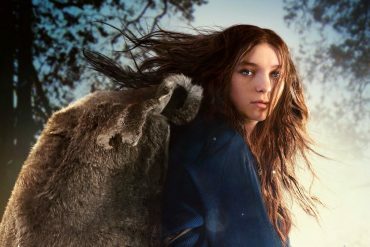 It’s a fairly harsh reality for kids who may be watching the film but it is dealt with in a way that doesn’t scare too much. 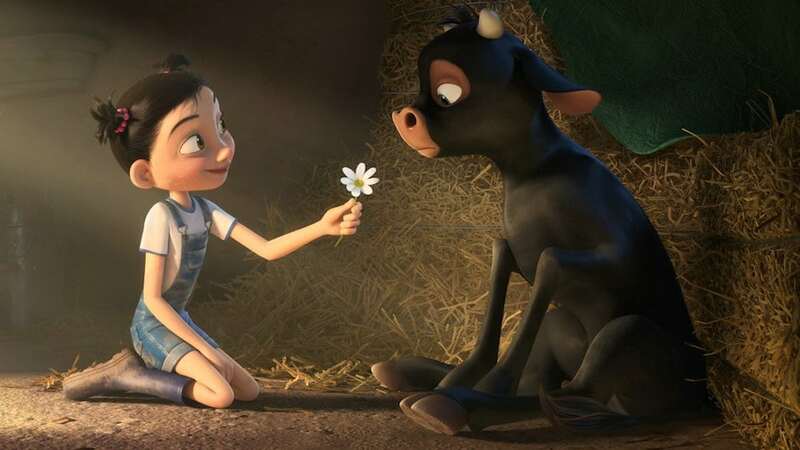 Without giving away too much, the rest of the film deals with Ferdinand and his bull-fighting destiny and how he looks to change the landscape and win people round to his way of thinking. As a wrestling fan, I’m not surprised that Cena is able to carry off an impressive performance as the loveable bull. He’s always had great comic timing and a decent emotional range as an athlete, and so brings his A game here to delivers a strong effort. If you’re a Kate McKinnon fan, you know what you’ll get with her as Lupe, and if you’re not already a fan you really should be. 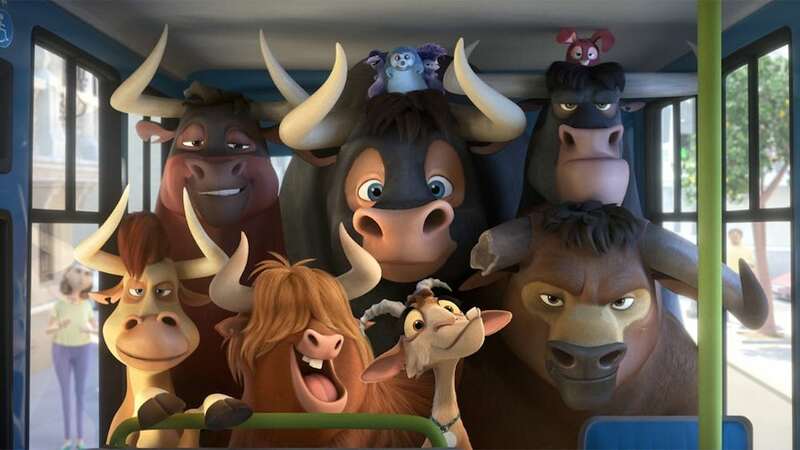 The supporting cast (Peyton Manning, Bobby Cannavale, Anthony Anderson, David Tennant) all come together to make Ferdinand’s story one that’ll make you smile, cry, and laugh along. 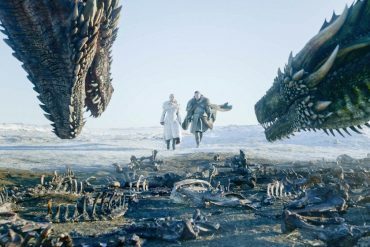 It’s full of what only family films can offer in terms of solid animation, bolstered by a meaningful story and plenty of wacky moments—mostly involving dancing animals—that are sure to have the kids jumping up and down in delight. While it may not hit the lofty heights of Toy Story (1995) or suchlike, that doesn’t mean Ferdinand isn’t worth a couple of hours of your time. It manages to strike a good balance between ludicrous and realistic situations, with Ferdinand’s persona translating right to the heart of human emotion and worldly issues. It would be easy for a movie such as this to be a one-dimensional cutesy cash-in, but credit to Fox and Blue Sky Studios for capturing the essence of Leaf’s original source material and delivering a heartwarming journey full of charm. Even the Blu-ray’s extras are worth watching, as you learn about healthy living, dancing, and all things Spanish and bullfighting. They managed to cover light moments of fun for the kids and more interesting ‘making of’ sequences for adults. 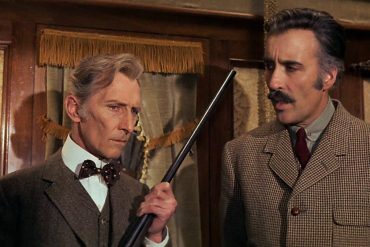 This is one film that will likely live on loop in your disc player for a while. “Ferdinand’s Guide to Healthy Living” with John Cena. “A Goat’s Guide to Life”. “Confessions of a Bull-loving Horse”. “Creating the Land of Ferdinand”. 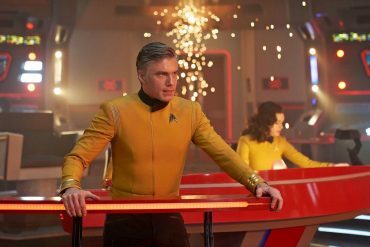 “Anatomy of a Scene: The Bull Run”. 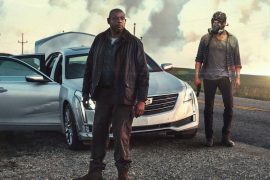 starring: John Cena, Kate McKinnon, Anthony Anderson, Bobby Cannavale, Peyton Manning & David Tennant.